Birddog can give us a historical account of this Zag establishment, dating back to the Pharoahs. Sam the Sham, that is. It was the prime spot to be when I was at GU in the 70's and they did not check ID. However, it went on a real down hill slide after that. Last time I was in there 15 years ago the place smelled like stale whiz, and that does not do much for the ambiance. I'm not optimistic that the BBQ will be any good, but I'll give it a try and report back. As someone raised on good Texas BBQ I haven't found anything close in Spokane. The chef worked at Lazy Bones. I tired that before it closed and was really hoping for the best, but could taste no smoke flavor. Seems like they use some electric contraption called a "smoker" but it comes nothing close to pit smoking with real wood. Legitimate BBQ shouldn't rely on sauce. It should stand on its own. Don't get me wrong, I really hope this stuff is good. BZ: This is much better! God Bless the drinking establishments on the NW and SE corners of the intersection of Sharp and Hamilton. Lots of good memories! Stale whiz stank or not! It probably smelled like stale whiz in the 70s, too. We just didn't pay attention to it at the time. Last time I stopped there was during my (25 year) reunion in 2001. It didn't appear like much had changed. Over the years, our tastes have changed, hopefully for the better. Good memories, though: $1 pitchers (was it Lucky Lager? ), free popcorn (damn it was salty! ), an occasional stromboli, and an occasional game of pinball. Longhorn Barbecue on Argonne Road and at Airway Heights is the best I've found around here. I tend to go to Pete's and David's in the Bulldog vicinity. Mesquite chips are a secret ingredient in Texas BBQ. The thought of a mesquite-smoked steak (or ribs) is making my mouth . Bulldog is awesome. That's my spot before games because you can actually get a beer. I do not like the crowds at Jack and Dan's before a game and it's next to impossible to get a beer there. If you are lucky enough to get a beer it usually is in a hot glass that just came out of the dishwasher. Jack and Dan's is great any other time. It's also possible to have too much wood smoke. I had some chicken a couple of months ago that was cooked over oak, and I couldn't get the friggin' oak smell off my hands for 3 days. Way, way too strong. There is no substitute for a good pitmaster. You should consider a fork. CDC doesn't eat anything w/o Tabasco and jalepenos and red peppers x10! Kind of hard to use a knife and fork on a drumstick. Plus it's just plain wrong. Such culinary treats require caveman principles. I can safely say that this chicken didn't have Tabasco, jalapenos, cayenne, Red Rooster Sauce or anything else on it. Strange but true. Just a whole lot of oak smell. My bad, I kind of forgot that chicken can come on a bone. I eat a lot of the frozen, boneless, skinless chicken breasts from Costco. For all my time spent there, I never realized they offered food. Go figure. Had many a burger and beers with Chris Sarbaugh's dad at the Bulldog. You're supposed to use a knife and fork on those?? That explains the disgusted looks from the wife...or at least some of them. I must have seen you there! Couldn't smell the stale whiz because of the stale popcorn aroma. You could also get a warm case of Fischer, Buckhorn, Regal Select or Lucky Lager for $4 to go. I was a bit partial to making sure you had a case of warm Buckhorn in the van, just in case a haha broke out. Texas, send a PM to reveal your actual being! Yeee Haw!! Did someone say Buckhorn!! Circa 1978, from the GU Bulletin. . . I'll bet that was some mighty fine wine at that price. . .
That's a serious amount of wine per serving. Best BBQ I ever had was at a ranch owned by relatives in Weslaco Texas. They cut mesquite limbs off their own trees to make the fire in the dual chimney barrel smoker. The steaks they cooked were awesome, so was the shrimp and corn on the cob. It's not the size of the Bulldog in the fight, it's the size of the fight in the Bulldog! Pete's Pizza next door had the calzones. 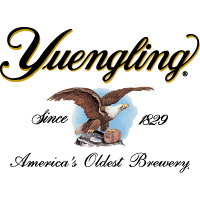 They tasted awesome when I was there, but of course anything tasted awesome after 3-4 pitchers. and of course ! the source of the stale whiz smell was the buckhorn. actual Bulldog whiz had a sweeter bouquet. I attribute some of the sweetness to the influence of a pack of Marlboro's, a gallon of Lucky Lager, several baskets of oily, stale popcorn & and a dozen or so spears of asparagus, traced back to the Cog. Per student. Add to that, steady doses of B.O. from Armand and several overwhelming waves of "inexpensive" perfume from Minnie, the proprietors, and we're almost there. For me, it's important to mix in a stromboli and a cherry blizzard from the Dairy Freeze to get the perfect, special, aroma, that constituted some of my "good old days" in the Bulldog. At its apex the hot provolone in a stromboli, itself, could constitute the best, most sweet whiz smell of them all. As soon as I turned 21, I switched to Joey's (now known as Jack and Dan's), where I.D. was checked. Last edited by gamagin; 04-27-2011 at 04:52 PM. Zagco favored the Raineer pounders back in the day, and when he was hungry. 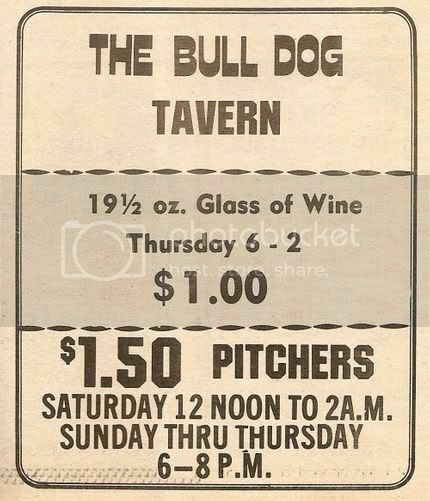 Bulldog was packed back in the day, especially on Thursday nights.